Have you considered volunteering for CHIP? 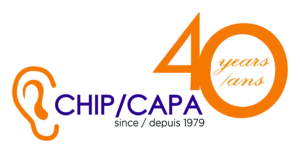 CHIP is Montreal’s only non-profit registered charity serving the anglophone community affected by hearing loss. For over 35 years, CHIP has relied heavily on volunteers helping in whatever way they can. CHIP is always looking for volunteers who can assist us in administrative tasks, and social programs / projects developers! Contact info@hearhear.org for more information. https://hearhear.org/wp-content/uploads/2018/01/Volunteer-Group.jpeg 4004 5868 info@hearhear.org https://hearhear.org/wp-content/uploads/2018/08/CHIP-Anniversary-300x153.jpg info@hearhear.org2017-11-10 11:02:162018-12-18 09:38:40Have you considered volunteering for CHIP? It’s been wonderful meeting many CHIP members over the past few months, particularly at the AGM this past May. It was an honor to be invited to talk about my challenging hearing journey. If you attended, I hope you enjoyed it! It’s amazing how your life can change in just a few minutes. Though I was unaware of it, I began to damage my hearing as early as twelve years of age. I spent summers in Northern Manitoba prospecting for gold with my thirteen-year-old brother and a seventy-year-old family friend. We canoed and dynamited our way across the province, hoping to make a strike. We did, but that’s another story. At sixteen to eighteen years I worked as an underground miner in Northern Ontario and in Yellowknife NWT, using pneumatic drills and regularly blasting as many as three or four hundred sticks of dynamite at a time. Ear protection was not considered important. From there, I spent seven more years in the field with the CNR, another notorious source of noise, particularly in the dying years of the steam era. If you have a hearing loss, there is an added layer of self-care needed. Being hard of hearing can add stresses and frustrations, and there is a whole gamut of new skills and tasks that require our attention. We have to learn more about hearing loss in general and our own hearing in particular.